More female caravanners are taking up solo travelling than ever before; we explore the trend and offer some tips. Studies have shown that more women are choosing to travel solo and this includes caravanning. We explore the trend and offer tips on how women can enjoy travelling alone. In 2014 TripAdvisor surveyed over 3200 Australian women to find out more about solo female travel and discovered that one in three travel alone for leisure. Nearly two-thirds (63 per cent) reported that travelling alone had changed them. The majority of women surveyed felt more independent (46 per cent) and free (19 per cent) when travelling alone. Many said they had gained confidence, while others felt that these liberating unaccompanied holidays changed the way they think about their lives. “When it comes to their precious holiday time, women are spending it visiting and exploring the places on the top of their list, not anyone else’s”, TripAdvisor spokesperson Cindy Tan says. So why are Australian women choosing to travel alone? Simple – to ‘get away from it all’, according to 82 per cent of respondents. Close to half the women surveyed said being able to choose their own schedule without worrying about others was the main reason; other reasons given were that their partner isn’t keen on travelling, they don’t have anyone to travel with or they simply love their own company. Anecdotally, we’ve also heard that some women travel solo because they’ve lost their partners, while others have chosen to sell the family home and live ‘on the road’ for as long as they can. It doesn’t require much to set up. It offers the added security of being able to jump into the driver’s seat and leave if a situation feels unsafe. Stay smart. Always keep aware of where you are and who you meet. If you’re having a casual chat with a shopkeeper, be mindful of who else is in the shop before mentioning you’re about to go set up camp in that remote spot by the river. Understand the vehicle – it’s your best friend. Remember to always check it has plenty of water, fuel and air in the tyres. Take an RV driving course and perhaps a mechanic’s course so you can do on-the-spot repairs. Start with short trips and put everything to the test. Have the vehicle and caravan thoroughly checked over and serviced before you leave. Understand what to do if you have a blowout, which can easily happen on corrugated outback roads that get very hot. Make sure the spare tyre is in good condition and the same standard as the others; it might have to last a long way on rough roads before being replaced. Join an automobile or road service association. Take regular breaks every few hours – you need to look after yourself as you’re the only driver. Pull over, make a cuppa and sandwich, then enjoy the silence and the view for a while. Stay entertained on long stretches with podcasts and audio books. Travel with others from time to time. This doesn’t necessarily mean sharing your RV; it could be as simple as driving in convoy or arranging to meet up somewhere along the way. It’s easy to make friends on the road. There’s really no reason why a woman travelling solo should feel unsafe, but if you’re concerned about camping somewhere, park near some Grey Nomads. They’ll ensure a secure, interesting and hospitable overnight rest spot. Carry a Personal Locator Beacon (PLB) with you. When activated, it transmits a message that’s picked up by passing satellites and relayed to emergency services. Only to be used in an absolute emergency, it’s handy and weighs considerably less than a satphone. If it has an inbuilt GPS locator, even better. Being independent doesn’t mean you don’t want to socialise, and you’ll find plenty of opportunities on the road. 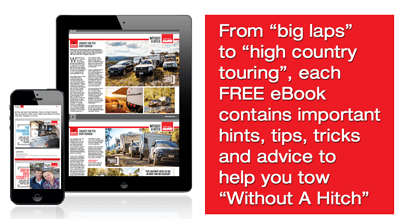 Our Guide to Solo Caravanning lists ways you can make friends and find the occasional travelling buddy for the long stretches. Why not hire an RV for a test run? We look at your options.